This embracing life and living with the now rather than relying on all that I hope to accomplish in the not-too-distant-but-not-defined-future has been pretty spectacular. It has led to one unexpected things though, I don’t find myself putzing about on the computer and writing blog posts because I’m actually doing things that I’ve been dreaming about starting. Also for whatever reason I imagined switching from full time employee to stay at home mom would equal endless hours of free time. I was wrong. I have kept a personal journal for years and I am not consistent with writing in there either. It always seemed silly to open up my journal, look at the blank page, and then write an apology to myself for living so much that I had not sat down to write in ages. And it is silly, so I don’t do it. During lovely lulls of life I have plenty of time to jot and journal but then life picks up and six months later I start off a new entry with “well a lot has happened – graduated with my masters, got married, hired for dream job, looks like we are moving to England…” and then I say something about the weather and move on. The weather here has been muggy and hot the past few days despite the rain. A few weeks ago I made a wrong turn, met a truly terrific stranger as a consequence, and promptly learned how to can applesauce. Hummingbird and I spent a warm but pleasantly breezy afternoon picking apples that had fallen on this new friend’s property. With the droning of the industrious insects all around and the heavy scent of perfectly ripe apples wafting up with every puff of wind I was transported to Redwall Abbey orchards, Huck Finn’s lazy afternoons, and every other idyllic place I had only visited in books before this. This bonnet didn’t last too long but it was too cute to miss the opportunity! Picking up apples is a perfect activity for a toddler. We wandered all over the property as Hummingbird ate her weight in apples. I noticed her hair is now the color of summer sun burnished grasses. When did her hair become so light? When did she become so self assured and adventurous? Oh I am so grateful to be able to take these days, moment by moment, to notice the growth that occurs with every breath she takes. On our way home I picked up some canning jars and a canning essentials kit at the dreaded Walmart. While standing in the isle I realized I had absolutely no idea how much applesauce or apple butter would come from the amount of apples we had. I also realized I had no idea how to can apples and maybe I was biting off more than I could chew. I bit anyway. I’ll admit that I picked the jars completely based on appearances. When all else fails judge the book by its cover. I bought a dozen 1/2 pint jars and a dozen 4 oz jars which could all be darling gifts. At home, as Hummingbird continued to snack on apples and crackers – seriously this child is a bottomless pit – I washed our haul. Mentally I was all ready to start canning but I realized that it was probably too late in the day. I did not want to be up all night learning a new skill so I left the apples bobbing in the sink overnight. First thing next morning I used this handy dandy Pampered Chef apple slicer to core and slice the apples. Then I popped them into this huge 12 quart stockpot to boil down with heat set at medium. After a few hours I puréed the contents with my immersion blender and transferred half of it (about 5 quarts) into to the crock pot to cook down into apple butter. The other half I poured into a large bowl while I cleaned out the pot, sanitized the jars, and boiled the lids in preparation for canning. You can see that I started out with two pots of apples. When they boiled down enough I combined them. Next time I will just wait till the apples have boiled down enough and keep adding them to one pot instead of starting with two pots; it really doesn’t take long for them to break down. Up to this point I had not added anything to the applesauce, it was tart but delicious and I loved it. When I added the 5 quarts or so of applesauce to the crockpot I added about 2 cups of honey and a sachet of spices consisting of cinnamon sticks, all spice, cloves, and cardamom. I used whole spices for two reasons 1) I didn’t have ground options for any of those spices and 2) I wasn’t sure if mixing ground spices in would add a grainy texture later on, by using an sachet (this one is made from a loose leaf teabag) I was able to easily remove the spices after they had thoroughly infused the apples with spiced goodness. I also picked these spices because they are my favorite Autumn flavors, I have no idea what are the normal spices for apple butter other than cinnamon. While the apple butter kept on cooking down on low with the crock pot lid slightly off, I filled 9 of the 1/2 pint jars with applesauce, put the lids and bands on, boiled them for 20 minutes, and then removed them from the pot and allowed them to cool untouched overnight. 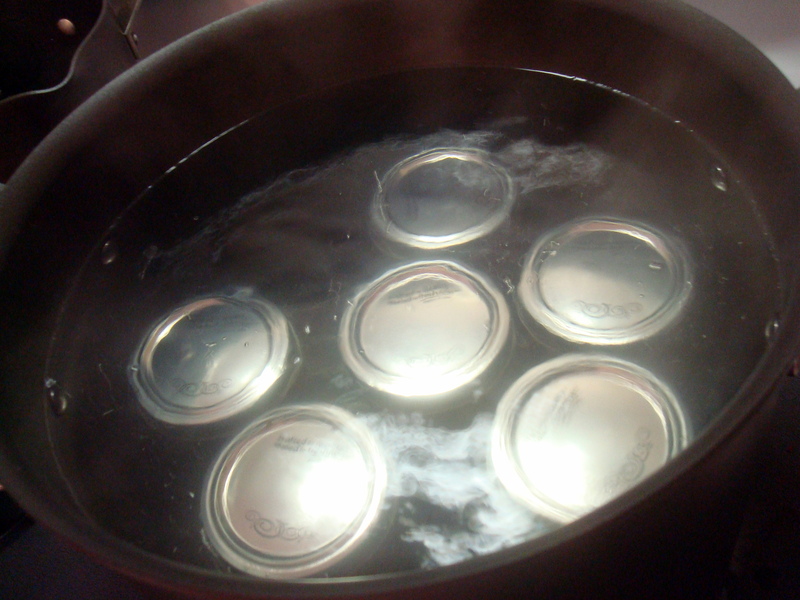 I didn’t have a pot specifically made for canning so I used my 12 quart stockpot and put a metal rack at the bottom so that the glass jars would be spared from being directly on the heat. 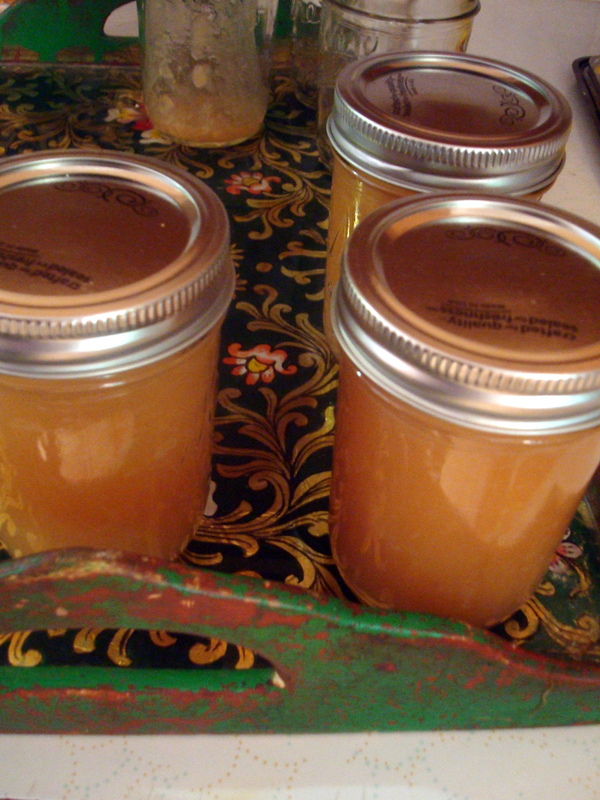 That evening, after the apple butter had slowly rendered down for another 5 hours or so, I canned the apple butter. I had enough for all 12 of the 4 oz jars, the 3 remaining 1/2 pint jars, and a 2 cup tupperware container that I just kept in the fridge for us to snack on for the next few days. It was a fun and surprisingly simple new skill. We loved the apple butter so much that since then I have made 9 more pints of it from apples culled from our friend’s land. And the little 4 oz jars have already served as terrific spur of the moment gifts. Who doesn’t love to give and receive a tasty homemade treat?